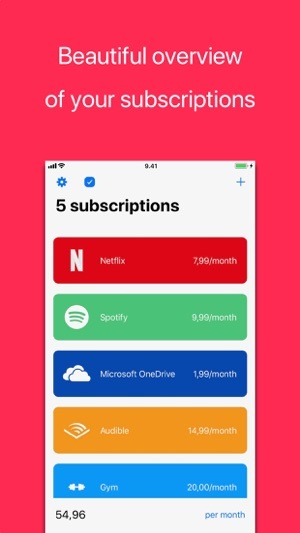 Easily manage your subscriptions with Subs. Get a quick glance at your recurring expenses and use the Review Mode to see how you can bring down your fixed costs. See all your subscriptions in an elegant, easy-to-digest list with vibrant colors. 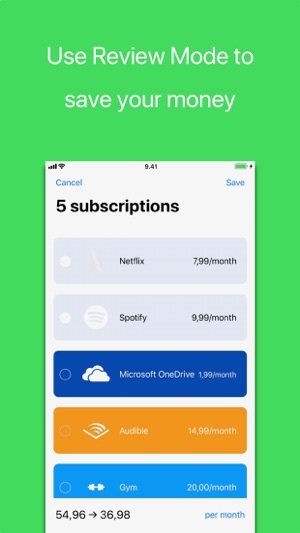 You can see each subscription and its respective cost per a time period. 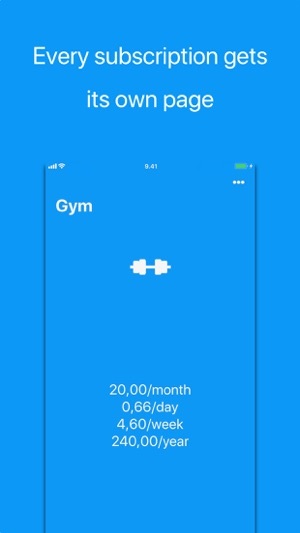 At the bottom of the screen is a summary that allows you to get perspective into your spending. You can look at the cost of your subscriptions per day, per week, per month or per year. Each subscription gets its own dedicated page that is just a swipe away. You'll see a breakdown of the cost, again in per day, per week, per month and per year basis. With Review Mode, it's now easier than ever to see concretely how you can save your money. 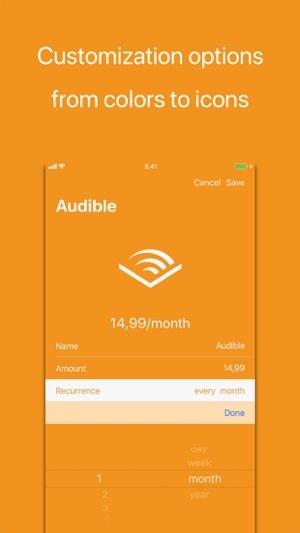 Enable Review Mode and start selecting subscriptions you might not need and the summary at the bottom of the screen updates to show your new costs. You can compare your saving in per day, per week, per month and per year basis. When adding a subscription, select from an ever-growing list of pre-made templates that update automatically, or create your own one from scratch. You can choose and accent and background color and either select an included glyph or choose your very own image as icon. Design for smaller displays. Passcode lock. Opt-out for analytics. 3D Touch on a subscription for quickly accessing more information. Swipe up or down on a subscription to edit it. It's all those little things that make Subs great. This update adds support for iOS 12 and all the new iPhones and iPads, as well as some bug fixes.